(left) Mini Yang and Nicholas Tse, and (right) Lau Ching-Wan in The Bullet Vanishes. The Skinny: While shamelessly derivative at one or two points, The Bullet Vanishes is a terrific commercial film with excellent performances, dynamite pacing and a strong production. Director Law Chi-Leung earns his parole from movie jail. by Kozo: Nicholas Tse and Lau Ching-Wan team for director Law Chi-Leung’s The Bullet Vanishes, and what a great idea that was. 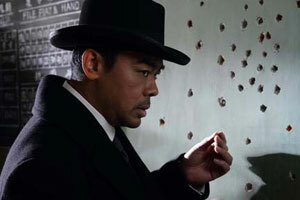 The award-winning actors play detectives in 1930s China who team up to solve murders involving “phantom bullets” that elude forensic analysis. Deaths at a munitions factory are blamed on a spectral curse even though factory owner Ding (a sneering Liu Kai-Chi) and corrupt police chief Jin (Wu Gang) are obviously up to no good. Enter local cop Guo Zhui (Tse) and transplanted investigator Song Donglu (Lau), who aren’t buying superstition as the cause of multiple homicides. Along with junior cop Xiaowu (Jing Boran), the intrepid duo tackles the mystery with dedication and playful gamesmanship. Given the period setting, the costumes, the self-amused score and Donglu’s penchant for trying out murder methods on himself, doesn’t this sound a tad like Guy Ritchie and Robert Downey Jr.’s Sherlock Holmes? Superficially yes, but that’s nearly where the similarities end. For one thing, Lau Ching-Wan has been doing the quirky, oddball detective thing since the nineties (see Running Out of Time and Mad Detective, not to mention Thou Shalt Not Swear and its sequel). Also, Nic Tse’s Guo Zhui is a pretty good detective on his own, plus there isn’t nearly as much wink-wink bromance between Tse and Lau as there was between Downey Jr. and Jude Law in Ritchie’s Holmes. Unfortunately, one sequence is a direct stylistic lift from Sherlock Holmes, i.e., the part where something’s about to explode and one guy gestures towards the other and then everything blows up in super slow-motion, plus the explosion goes on forever. The moment is a total Sherlock Holmes rip-off and such an obvious one that it should be asked: was director Law Chi-Leung that hard up for ideas on how to stage an explosion with two guys in a corridor-like space? Putting Law’s swipe aside, Bullet Vanishes succeeds as an exceptionally solid and entertaining commercial film. Key to its success is the two leads, who play off each another beautifully. Tse is more intense than the relaxed Lau, and gives his justice-seeking cop a strong yet shaded integrity. Lau may be better, however, delivering an affecting and charismatic performance despite being called upon to supply occasional comic relief. Both actors defer to each other when required, and each takes command with equal convince. Distaff support is varied. Mini Yang (as informant Little Lark) is barely more than ornamental, but Yumiko Cheng (as the local precinct’s coroner) and most especially Jiang Yiyan (as an imprisoned love interest for Donglu) turn in good support. Liu Kai-Chi overacts like a comic book villain (complete with pasty white makeup) while Jing Boran brings a likeable and righteous youth to his role as the inexperienced Xiaowu. Bullet Vanishes also features a cleverly crafted and smartly paced storyline. The film sets up each mystery with relevant clues, with the exposition neatly handled via the characters’ ongoing investigation, not to mention the requisite flashbacks illustrating what they’ve deduced. The phantom bullets can’t be supernatural (usually a SARFT no-no) and yet the filmmakers find a believable way to justify their premise. Potent details, like the film’s multiple games of Russian Roulette, are interspersed throughout, and even when plot holes and story omissions threaten to crop up, the confident pacing and strong performances smooth things over. The script from Law Chi-Leung and Yeung Sin-Ling is fast and smart but occasionally awkward. Jiang Yiyan’s character is an example; despite Jiang’s strong performance, the character exists largely to fill an expository need. The climax, a winner-takes-all face-off between two characters, also gets too explanatory and stagey. However, the acting and Law’s deliberate tension more than compensate.